Is Negative Leverage Complete Lunacy or a Worthwhile Development Risk? In today’s debt focussed market, many builders, developers, and property flippers are contemplating the once-taboo notion of building or buying for "cash" because the horror stories from 2008 are still fresh in our minds. But, should the average real estate investor (we’re not talking about billionaires or large institutional funds) utilize the traditional advantages of debt leverage or do the risks associated with a negative leverage ratio outweigh the tax or increased return benefits of significant construction or development loans? 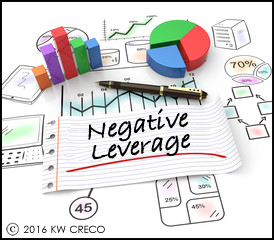 Negative leverage occurs when a project’s return is less than the interest rate on borrowed money. Just as positive leverage elevates returns, a negative leverage ratio can quickly dwindle a project’s built-up cash reserves. While this may initially induce caution to any lender, there are some situations where negative leverage is anticipated and accepted, such as in the early stages of the investment. Many times raw land or significant renovation development projects will incur negative leverage in the first years leading up to partial stabilization of the project. In these instances, it is critical that proper reserves and management parameters are established to adequately service the debt until the point where the project provides cash flows greater than the required debt service. If, however, the lender is provided with ample security, such as personal guarantees, low loan to values, or amble interest reserves, there is little to fear by negative leverage in the first year of a development project. situation, understanding the property and the property’s future potential cash flows are vital to securing future returns on the debt. If a borrower does not quickly establish positive leverage, there is little that the borrower can do to avoid default.